KCCA FC missed a chance to go six points clear at the top of the StarTimes Uganda Premier League as they were held to a 1-1 draw away to Tooro United. After Vipers losing 2-1 away to Ndejje University, KCCA knew that a win would see them move closer to a third championship in four years but could not overcome a spirited Tooro side. After a goalless first half, the game came to life in the second half as both goals came in the last 37 minutes. First it was the home side struck on 53 minutes through former SC Villa and Express FC forward Godfrey Lwesibawa. 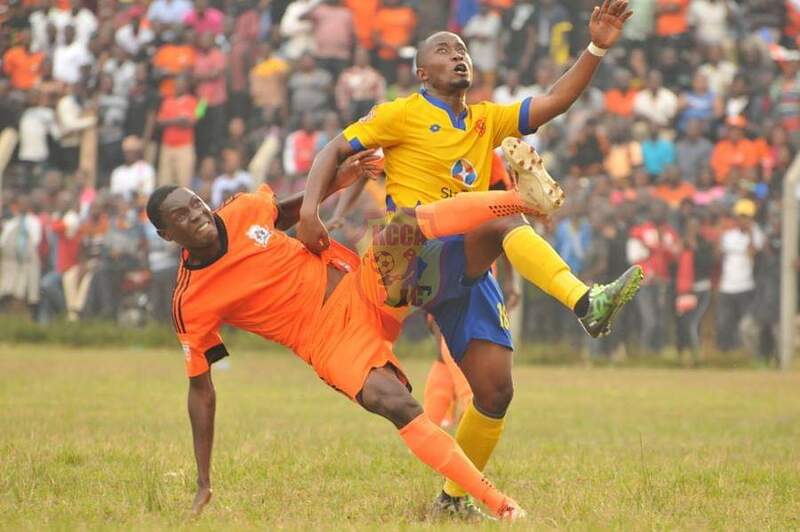 However, Tooro’s joy was short lived as KCCA equalized seven minutes later off a Mike Mutyaba deflected free-kick. From there on wards, efforts by either side to win it fell to hard ground as the respective backlines stood firm to repel any threats. In the end, they had to settle for a point each, at the sound of the final whistle. The point earned sees KCCA move onto 48 points, four ahead of second placed Vipers with only 7 games to play. For Tooro, they remain 7th on the log with 33 points. In Luzira, Maroons took a huge step to attaining their top tier status thanks to a 1-0 at home Bright Stars. The only goal of the game came 22 minutes from time through a Pius Obuya converted penalty. The win sees Maroons move into 12th on the standings with 25 points while Bright Stars slip into 11 on 28 points from 23 games. In Zombo, Paidha Black Angels’ survival hopes were dented a huge blow as they lost 2-0 at home to URA FC. In-form midfielder Saidi Kyeyune scored the opening goal of the game inside 13 minutes to silence the mammoth home crowd. As fate would have it, former Paidha captain Cromwell Romwothio made it 2-0 with 8 minutes to the break to ensure the tax collectors go into the break with a commanding lead. In the second half, it was all about game management for Sam Simbwa’s URA who would see out the 2-0 result. The loss for Paidha sees them move back down the pile with 12 points collected so far this season. For URA, they remain 4th but close in on Mbarara in third. The Tax Collectors now have 38 points, 2 behind the Ankole Lions. In the other game played at Njeru, Bul FC registered yet another home victory, defeating Police 2-1. Jimmy Kulaba handed Peter Onen’s side an early lead on 13 minutes to send the home fans into a frenzy. Two minutes to the half hour mark, James Otim doubled Bul’s lead o make it 2-0, a caution they held up until halftime. Police who are re-known for their fluid attacking brand of football would not go down without a fight however, reducing the deficit 5 minutes into the second half through Ronald Nyanzi. Despite relentless attacks by Abdallah Mubiru, Bul held onto a 9th victory of the season. The win sees Bul climb into 5th on the table with 35 points while Police drop to 10 having gathered 29 points so far.